Food blog & restaurant reviews in & around Cardiff, the Vale of Glamorgan, South Wales & wherever else my gastronomic adventures take me! The Social, in Cardiff’s Parc Thistle Hotel, is one of those places I’ve always meant to visit but never quite got round to. A couple of weeks ago, however, the incentive I needed came – in the shape of an invitation from some friends who wanted our company while they used a voucher they had from one of the daily deals sites for a meal at the Social. So, we ate there on a Saturday night. It was previously the Crown Social – a now defunct attempt by chef Martin Blunos to bring Michelin quality dining to the centre of Cardiff – but is now just the Social, with new chef Iain Inman at the helm, and still has a reputation for good food, with two AA rosettes to its name. On arrival, we decided to have a drink in the hotel bar – a beautiful room, but sadly completely empty apart from us, so we didn’t stay long. We were then shown to our table, which was in what seemed to be another bar area, albeit a more restaurant-like one! One of our friends went to use the toilet while we looked at the menus, and on his return reported back that there was in fact a ‘proper’ restaurant area behind the wall that our table was next to, and that it had a much nicer (less bar-like) atmosphere than where we were sitting, so we asked if it was possible for us to move. To the credit of the staff, they sorted this out for us very quickly, with no fuss or face-pulling, and we were soon seated at a much nicer round, booth-type table, in an area with more fellow diners to keep us company and a bit more of a Saturday night atmosphere. We started with a selection of breads – I had a piece of the olive bread, which looked nice, but was sadly a bit doughy and heavy. I didn’t try the white or brown options, but was told these were better. 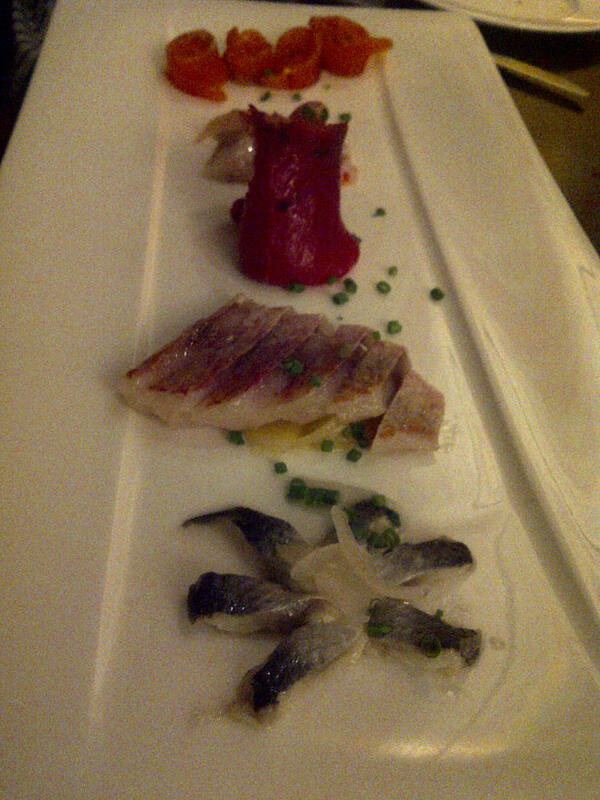 To start, Mr W and I chose one of the Social’s sharing platters – in our case a selection of smoked and cured fish. We enjoyed it – it had a good selection of some fairly unusual fish, and reminded me of the kind of pickled and cured fish more commonly served in Scandinavia. My only complaint, however, was that it wasn’t really served in such a way as to be conducive to sharing – several of the items had to be cut in half, and the layout, on a long, narrow plate, also made it a little awkward. Mr W and I are used to sharing food, but the acid test for me on a sharing dish is whether there would be any awkward moments if you were sharing it with someone you didn’t also share your bed with – and in this case, I think there would have been! Our dining companions chose a sweetcorn soup with smoked chicken (this was my second choice from the menu had Mr W not wanted to share) and an artichoke dish (I forget exactly what it was). They also both enjoyed their choices. 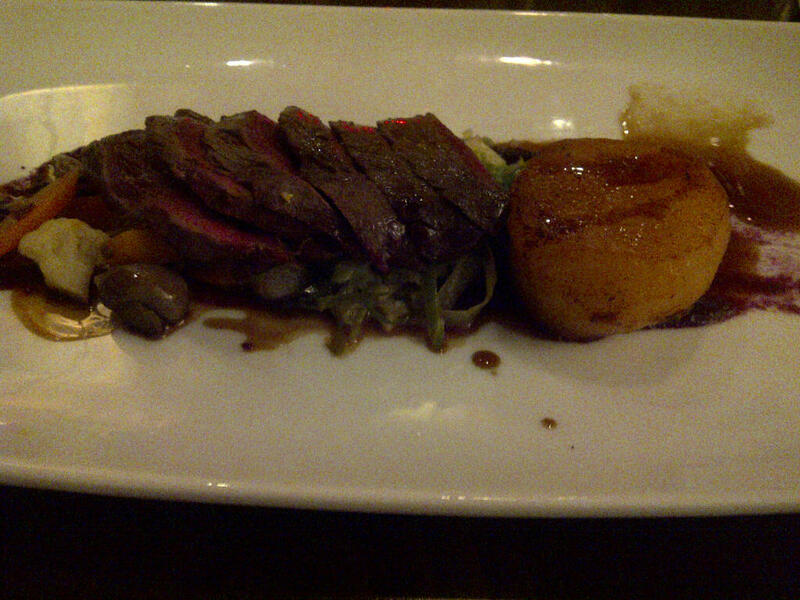 My main course was venison, served with pickled vegetables, fondant potato and cabbage, and a red wine sauce. This was an excellent dish – the venison couldn’t be faulted and the accompaniments worked well with its richness. We had a few side dishes as well, and the one I enjoyed most with my dish was a gratin of potatoes, leeks and bacon – really good. There was also some very nice mash (Yukon Gold, apparently) on the go! My first choice of pudding was a banana soufflé (with the obligatory 20 minute souffle waiting time), but after two of us ordered this we were told that there was no more banana available and instead, the offering was pistachio. Our friend went ahead with this, but I changed my order, and was very pleased I did, as I ended up with raspberry macarons, served with raspberry sorbet and liquorice cream. This was fantastic! I love macarons, and to have them served as a dessert is heaven – I don’t know why I had even considered the soufflé! The liquorice cream initially left me in two minds, especially when I realised it was inside the macarons as well as on the side, but it had a very delicate flavour which didn’t overpower the raspberry at all, and the creamy texture was a good contrast with the sorbet. A fantastic flavour combination. 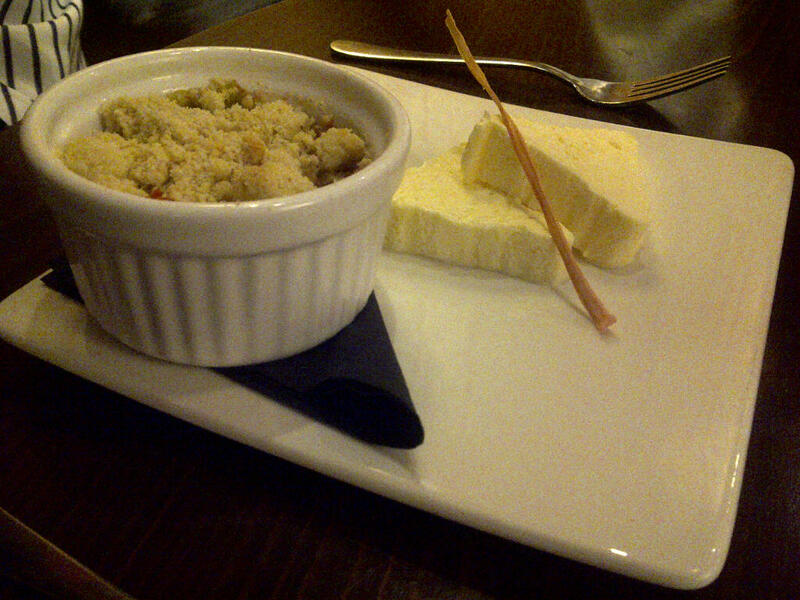 Other choices around the table were a fruit crumble, which Mr W polished off before I could try it (I’m told it was very good, but hence I can’t tell you what kind of fruit it was, nor what the accompaniment was!) 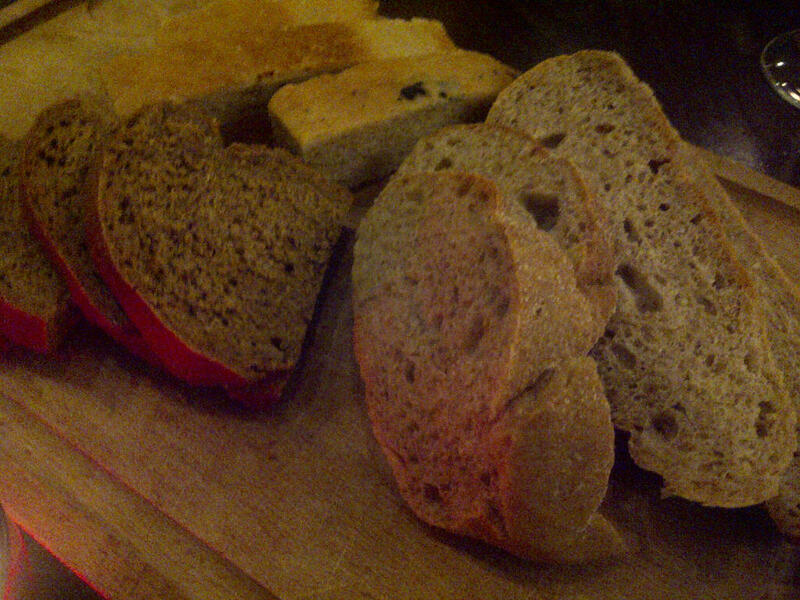 and a very generous cheese selection with an even more generous helping of biscuits and bread. We finished off with various coffees and digestifs. The food we tried was excellent, and I can’t really find fault with any of it, but I’m still not sure I’d rush back to the Social as, for me, it lacked something – I just can’t quite put my finger on what! I appreciate that’s an incredibly subjective statement to make, so I’ll try to explain, as it may be that it would be a perfect venue for some people! 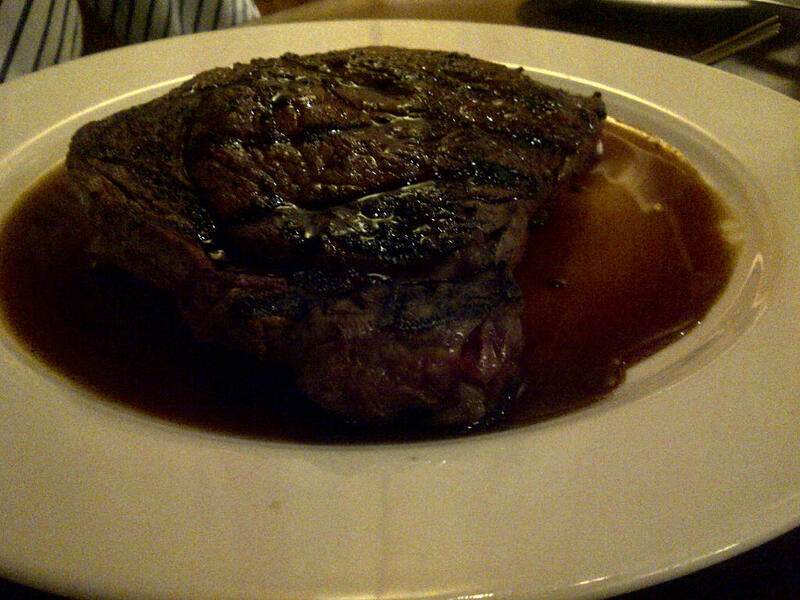 The food itself wasn’t cheap, with mains hovering either side of the £20 mark. We didn’t have a voucher, so our meal, with wine, came to around £70 per head. The quality did warrant the prices we paid, but at those prices, I’d want a pretty near perfect experience in order to rush back. The service was efficient, but I felt at times it was a little bit ‘stuffy’ – trying too hard to be formal and as a result losing some of the personal touch which is always welcome, even in fine dining establishments. We are a chatty bunch and we often chat to the waiting staff in restaurants. This visit was no exception, and although they were polite enough, it was almost as if they felt uncomfortable chatting to patrons (of course, maybe it was just that they didn’t like us!) I think sometimes restaurants make the mistake of thinking that formal has to equal impersonal – but I’ve experienced some great examples of five star service with a very personal and friendly touch. Similarly, I felt the ambience was a little bit lacking. It’s an odd set up with the hotel effectively having two bars, one of which is in fact part of the restaurant, and I’m very glad that we moved tables as I think we’d have felt a bit out on a limb had we stuck with our original table. Even once we moved, although the area had more atmosphere and was more comfortable, it still had a ‘hotel dining room’ feel to it. Sadly, very few hotel restaurants manage to overcome this, and even on a busy Saturday night you tend to find yourself expecting to see solo diners hiding behind a newspaper, or a rack of breakfast cereals lurking in the corner. We were admittedly quite late to leave the restaurant area, and as a result, we were able to witness the laying out of the jams and marmalades at neighbouring tables for the following morning’s breakfast! I think on the whole, despite my reservations, I would still recommend the Social. The food was excellent, and I think my minor issues with the service and ambience are subjective ones, so perhaps you should give it a go and decide for yourself! Love to Dine is a food blog, focusing mainly on restaurant reviews in Cardiff and the Vale of Glamorgan, South Wales. It is written by Hannah Poulton, who loves eating, cooking and everything to do with food! Her favourite way to spend her spare time is dining out - either trying new restaurants or returning to her favourites. She lives in Penarth, just outside Cardiff and is a contributor to the Guardian's Comment is Free. Her blog has also been featured in the Western Mail. Hannah would love to hear from you if you have any restaurant recommendations, if you work for a restaurant or food business that would like to be featured, or would simply like to comment on one of her reviews. You may not reproduce, copy or borrow content from this blog without my express consent. You may link to and quote (with an appropriate credit) from this blog. I'd also appreciate an email to let me know if you do. Images are either my copyright or are legitimately sourced and will be credited as such. Again, you may not use, reproduce or borrow my images without my express consent. All views are my own, and all restaurant visits are undertaken as an anonymous, paying guest, unless otherwise stated.